When you are eating low fat, you wind up eating a lot of chicken breasts. It’s inevitable. Fortunately, chicken breasts are rather “neutral” and can be made in a lot of interesting ways, from breaded chicken fingers to curries. But I am always looking for something new to do with them so I don’t get bored. This is a very tasty way to make chicken that is a little different. The sauce is rather brothy, so much so that I plan to experiment with the recipe to create a soup. 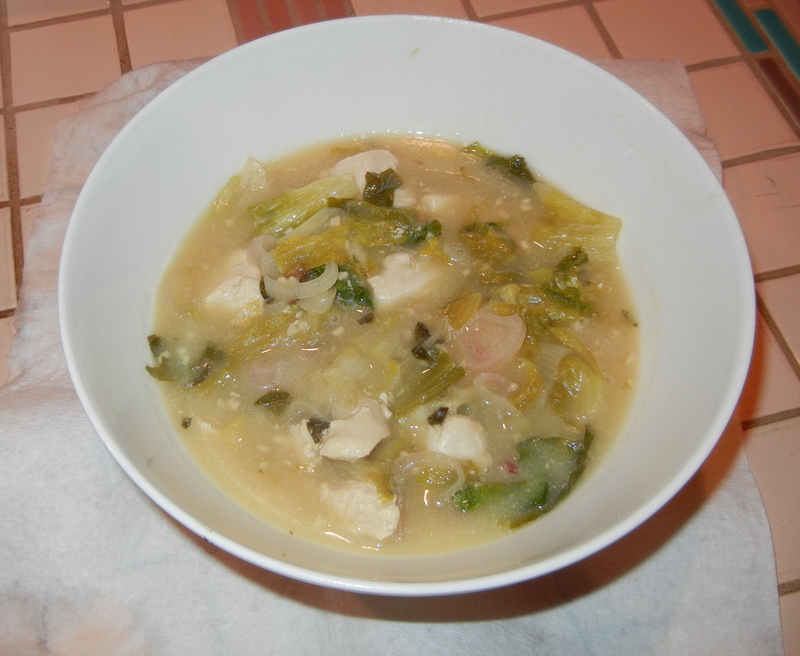 I had a bit of trouble finding escarole – maybe because it is winter. You could probably use another kind of greens, but escarole has the right crunch. The original recipe was from Eating Well, and I reduced the amount of olive oil to lower the fat a bit. It reheated well for lunch, but I’m not sure it would freeze well because the greens might lose their texture, which is a big part of the charm of the dish. I served it with a nice crusty bread. Warning – this is VERY garlicky – which I loved, and was one of the real attractions of the stew. But if you’re not a garlic fan, you might try to reduce the garlic by half. Don’t eliminate it though. Garlic is one of the flavors that make this stew special. Whisk water, mustard and cornstarch in a small bowl; set aside. Heat oil in a Dutch oven or large pan over medium heat. Add shallots, garlic and rosemary (or other herb); cook, stirring, for 1 minute. Add wine, cover and bring to a boil over high heat. Uncover and cook, stirring occasionally, until the wine is almost evaporated, 5 to 6 minutes. 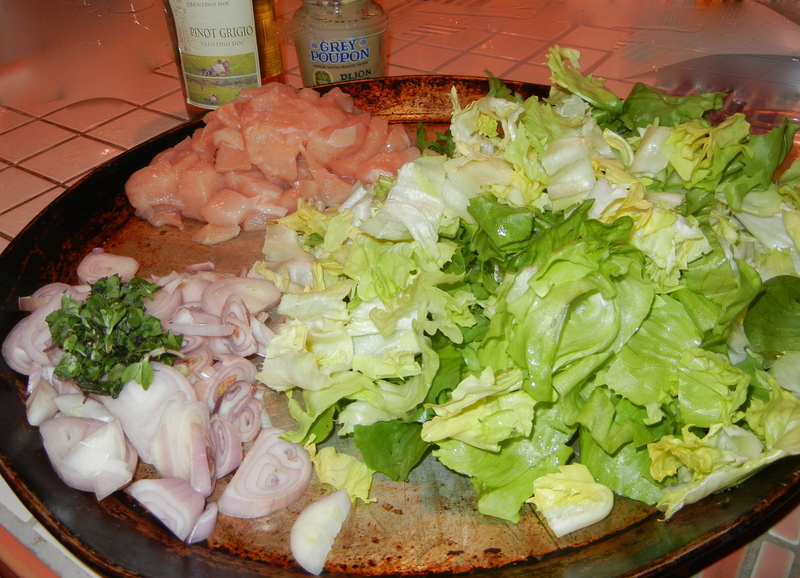 Add chicken, escarole and broth. Bring to a simmer and cook, stirring occasionally, until the chicken is cooked through, 3 to 5 minutes. Whisk the cornstarch mixture and add to the pot. Bring the stew to a boil and cook for 1 minute or until slightly thickened. Season with salt and pepper. Makes 4 servings @ 3.5 grams of fat/serving.